Over time, I have come to learn that there are two types of Arsenal fans: wild optimists and wild pessimists. There is very little grey area when it comes to supporting this football club, even when the reality lies somewhere in the middle. And while people in the grey area certainly do exist, they're never as loud as the ones on either side of the spectrum. That tends to be true across much of the political spectrum as well, but I digress. Arsenal Twitter, which occasionally resembles one of the nine circles of Hell (Anger? It's anger, isn't it? ), seems to be under the impression that Arsenal are out of the title race, despite the fact that they are five points out of first, still have the opportunity to play the three teams ahead of them in the table, and have 14 games to play in the season. If you think a five point gap is insurmountable with 42 points remaining on the table, there's a problem there. Let's not be too optimistic, either; Arsenal's form right now is legitimately concerning, so I don't want you to think that I'm all sunshine and lollipops here. Arsenal might only need to make up five points over the next 42 available, but they have only won three of the last 12 possible and they haven't scored a goal in league play since Thatcher was in power, I think. After this, Arsenal host Leicester in a match that will do much more to decide the title race than a draw with Southampton, then it's a cup tie with Hull, Barcelona at the Emirates, United at Old Trafford, a midweek home game against Swansea, and a trip to the Lane to face Spurs. Things aren't exactly getting easier for Arsenal, so they might as well get back on track now! Okay, I don't believe anything has changed regarding Arsenal's injury list since the midweek fixture, so I'm at a loss for things to say in this section. I suppose we could talk about rotation. After serving his one match ban against Burnley, Per Mertesacker returned only to the bench on Tuesday, as Laurent Koscielny and Gabriel started at center back. It's starting to look like Kos is in desperate need of a break, in my opinion, but it's not like Arsene Wenger is known for giving his center backs that much of a breather. Speaking of breathers, I would expect Francis Coquelin to come back into the squad after he was held out of Tuesday's match; he would have played two matches in four days if he had been picked to start against the Saints. It'll be Mathieu Flamini almost certainly dropping in that place. The only other question is whether Theo Walcott returns to the XI after coming off the bench on Tuesday to do absolutely nothing. I've got a feeling Theo starts for Joel Campbell, even though I wouldn't be too happy with that. Bournemouth have a pretty astonishing four players in danger of missing this one through knee ligament injuries. Three are out long-term, as Max-Alain Gradel is out until March, Callum Wilson is out until April, and Tyrone Mings, the club's record signing at the time, is out until September after he was injured just six minutes into his Bournemouth debut. The other knee injury is an MCL sprain for Junior Stanislas, who is listed as a doubt by some sources. The other doubt is Tokelo Rantie, who might miss out with a muscular injury of some sort; sources are not clear about which of the human body's 640 to 850 muscles he has injured. I mentioned earlier that Tyrone Mings was the club's record signing at the time back when that deal was finalized in the summer window. They have since broken that record on the purchase of Arsenal academy graduate Benik Afobe, whom they signed from Wolves for £10 million. You can bet that he'll be fired up to score against his old club; Afobe never made an appearance for Arsenal's first team. Predicted XI: Boruc, Smith, Francis, Cook, Daniels, Surman, Ritchie, Pugh, Gosling, Arter, Afobe. So, it's four now. Four in the league without a win. Draw, draw, loss, draw. No goals scored in the last three, either. Worrying, to say the least. This is Arsenal's longest sequence without a win in the league since the end of the 2013/14 season, as they blew their chances in that title race with the 6-0 loss to Chelsea, draws against Swansea and City, and a 3-0 loss to Everton. They bounced back from that to win their final five, rebounding from a fifth place scare to finish fourth, as per usual. As for the last time Arsenal went winless in five league games? You'd have to go back seven years to a string of five straight draws in January and February of 2009. That came in the middle of a string where they were unbeaten in 21 though, so it's not really the same. The fact that Arsenal have gone three without scoring is perhaps the most worrying feature of their current form. The last time Arsenal went this long without scoring in the league was... well, that same run of draws I just spoke about; the first draw in the sequence was 1-1 with Everton (in which Arsenal needed a late equalizer from Robin van Persie.) That was followed by 0-0 draws against West Ham, Spurs, Sunderland, and Fulham before Arsenal broke the stretch with a 3-1 win at West Brom. It was Nicklas Bendtner who broke the streak, FYI. Much like this current run, that stretch was not a winless streak across all competitions, as the Gunners beat Cardiff in the FA Cup and won the first leg of their Champions League Round of 16 tie against Roma during that span. As for Bournemouth, they are 15th in the Premier League, but are seven points clear of relegation. They have advanced to the last 16 of the FA Cup with victories over Birmingham City and Portsmouth, earning them a home game against Everton in the next round (perhaps we'll see a reprisal of that 3-3 draw...) After going winless in four over the holiday period in the league, the Cherries are unbeaten in their last three, beating Norwich 3-0, drawing Sunderland 1-1, and beating Crystal Palace at Selhurst Park 2-1. As this is Bournemouth's first year in the top flight, the reverse of this fixture, played back on December 28, is the only historical league meeting between the two clubs. Arsenal won the match 2-0, with goals from Gabriel and Mesut Ozil. The clubs have only met once before this season, in the third round of the 1987/88 League Cup; Arsenal, the League Cup holders at the time, ran out 3-0 winners. They would go all the way to the final for the second consecutive year, where they lost to Luton Town, who finished 9th in the top flight that year. 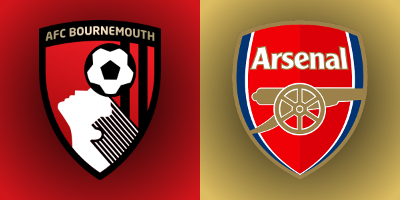 Both prior meetings between these two clubs have been played in North London; this is Arsenal's first ever trip to Bournemouth. The referee is Leicestershire-based Kevin Friend. Arsenal have seen Friend twice this year; both were on the road and both were clean sheet victories. In late October, Friend was in the middle for Arsenal's 3-0 win over Swansea City at the Liberty Stadium, then in mid-December, he was the referee for Arsenal's 2-0 win at Aston Villa. Bournemouth are unbeaten with Friend this season as well, beating Sunderland 2-0 in September, in which they scored both goals within the first nine minutes. He was also the man in the middle for Bournemouth's bonkers 3-3 draw with Everton in November. John Painting is a contributing writer to the Modern Gooner and is beyond human comprehension. You can follow him on Twitter @žờŗŕŏĉẫţ.